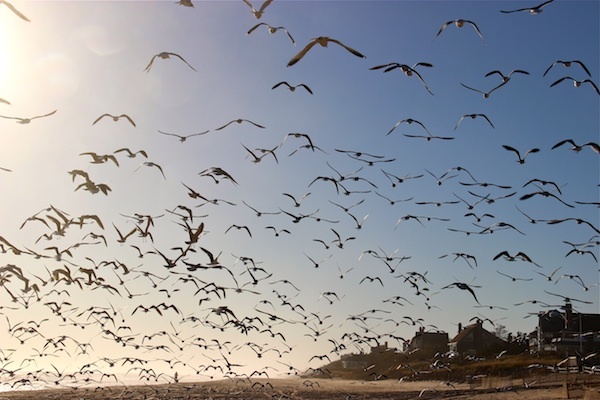 Seagulls and mimes share a place in this world – both are loathed. Now I’ll get to defending mimes another time, but for now let’s look at the seagull. Seagulls are monogamous, mate for life, rarely divorce, are nice to their offspring and truly value friendship. Yes they will eat your avocado and tomato panini if you leave your towel for a split second but that is only because they have excellent eyesight and good taste. They are one of the few species of seabirds that can survive on drinking salt water. They are expert fliers, having mastered control of winds, thermals and dives. They have a highly developed communication system with sounds and movements which you may have noticed when two or more are battling for that morsel you are contemplating tossing from your car window. What is most intriguing about seagulls is how creative they are at problem solving. How do you open clams and other hard shelled mollusks without a knife? Drop them on rocks from just the right height. Too high and someone might swoop in and retrieve your dinner. Too low and the shell won’t break. How do you teach your offspring to be kleptomaniacs? Demonstrate how you can steal another bird’s catch midair or what you can learn by observation. Somehow the seagull has figured out that the pelican needs to drain the water from its beak before swallowing. So the seagull waits for the pelican to make its catch and then grabs whatever it can before the pelican has finished draining. The seagull is also the state bird of Utah. If not for the seagulls dealing with a plague of crickets the Mormons never would have been able to settle Salt Lake City. The feat is called, “The Miracle of the Gulls.” Now did the seagulls know that they were changing the fate of hundreds of thousands? Probably not. They just like to eat crickets. Now before you write me off as nothing more than a gullophile, remember this. Think like a seagull. In business. In life. Always be on the lookout for opportunity. Use innovation to overcome unforeseen obstacles. And ignore those haters. They’re just jealous they can’t fly as high. With our without a panini.